Based on worldwide studies, the top two causes of mortality and morbidity among children less than 5 years old are pneumonia and diarrhea. Here in the Philippines, according to the National statistics, there are 37 Filipino children who die each day because of pneumonia alone. The good news is we can all do something to prevent it from happening. 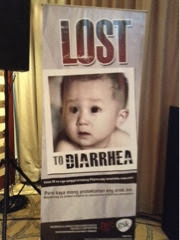 A campaign called "No Hope Lost" has been launched for awareness and prevention of both the dreaded pneumonia and diarrhea. Pneumonia is a disease of the lungs characterized especially by inflammation and consolidation of lung tissue followed by resolution and by fever, chills, cough, and difficulty in breathing and that is caused especially by infection. Pneumococcal disease is an infection caused by the bacterium S. Pneumoniae also known as pneumococcus which may result in life-threatening conditions such as pneumonia. It can also result to Acute Otitis Media (AOM) which is an ear infection, a common and highly prevalent disease. It also includes severe diseases such as meningitis, complicated pneumonia, and sepsis (blood poisoning), which occur when the pneumococcus "invades" the blood. The invasive forms of the pneumococcal disease are a category called Invasive Pneumococcal Disease (IPD). Diarrhea on the other hand is the second leading killer of children under 5 years old which had 1.4 million child deaths annually. Rotavirus Gastroenteritis (RGVE) is the common cause of diarrhea and severe dehydration in young children. Rotavirus infects every child within the first 5 years of life, irrespective of race or socio-economic status. I can totally relate as my son Kyle had also suffered from pneumonia on his right lung when he was five years old. We had no idea that he had pneumonia. And we sort of found out about it only at the time he was brought to the hospital after symptoms of German Measles came out of him. After he was checked by his pediatrician, we were surprised he asked for an x-ray test. And that's how we learned Kyle had pneumonia. That was more six years ago. Today, I thank God that Kyle has grown up to be healthy and is now on his pre-teen years. I knew no parent would want to see their kid suffer from these lethal diseases. We'd try our best to protect our kids in whatever way we can. Cliche as it may sound, but prevention is always better than cure. And as parents, we had the power to keep our children safe and healthy. 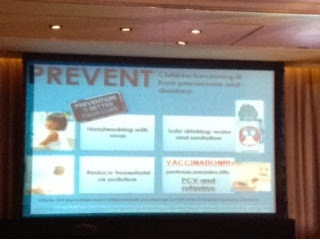 Both diseases, rotavirus and pneumonia are highly preventable. Early protection is the key to reduce the disease burden. 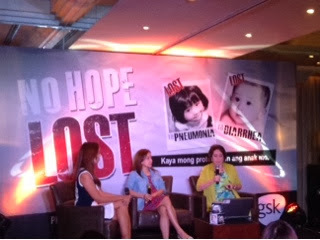 During the "No Hope Lost" launch held at the Makati Shangri-La Hotel, Dr. Sally Gatchalian, Philippine Foundation for Vaccination Director, stressed, "You can protect your child by means of breastfeeding, hand-washing, preventing air pollution, adequate nutrition and through vaccination. The earlier a child gets vaccinated, the better. 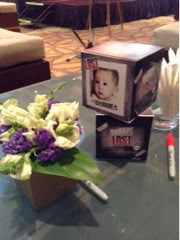 Babies can get vaccinated in as early as 6 weeks." 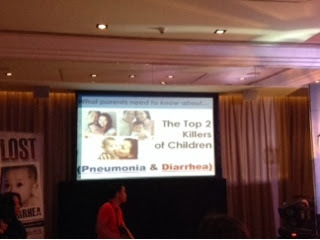 "It' s the best time to raise awareness on pneumonia and diarrhea prevention. These diseases should not cause unnecessary suffering to young children. Sometimes it's just that parents don't know enough about these diseases, and they don't know that there are actually vaccines for them," adds Dr. Gatchalian. The Philippine government has already acknowledged and addressed this by launching Rotavirus Vaccine as part of the Expanded Program on Immunization (EPI) where a total of 700,000 Filipino children aged 6 weeks up to 6 months of age were able to received free rotavirus vaccines. In 2013, the Department of Health leveled up this program as they introduced yet another novel vaccine called Pneumococcal Conjugate Vaccine (PCV) in the EPI. Dr. Gatchalian also debunked the myths linking vaccination to autism. "There is NO TRUTH to that. Lancet has withdrawn the data hullabaloo finding on linking MMR vaccination and autism. I would like to make it clear that vaccination had no effect or whatsoever on autism. it is such a kaput issue, the doctor who created such issue no longer had his medical license to begin with," explains Dr. Gatchalian. GlaxoSmithKline or GSK, known as the world's leading researched-based pharmaceutical and healthcare companies continues its commitment to partner with health practitioners and the government in the fight against childhood diseases such as rotavirus and pneumonia. 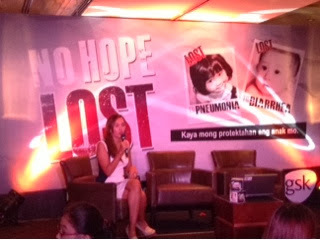 The "No Hope is Lost" campaign embodies the need for immediate action for children to be vaccinated against pneumonia and diarrhea. "With the help of our dear pediatricians, and the Department of Health, we our committed ti the reduction if pneumonia and diarrhea cases nationwide by supplying quality vaccines. 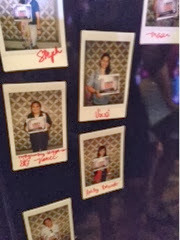 These diseases account for an alarming almost 50 mortalities per day in the Philippines. GSK is here to support the Filipino medical community and the government's drive to make health services accessible to everyone," added Philip Cruz, GSK Medical Director. To lose a child is the most heartbreaking experience a mother can ever have. Hope is within our own hands, we could prevent the loss of our children and fight against pneumonia and diarrhea through vaccination--these are diseases that are now vaccine-preventable.